Ceramic braces are a more discrete alternative to traditional braces. Ceramic braces are nearly identical to traditional braces except the bracket is made of tooth-coloured ceramic instead of metal. They look better and blend in with the shade of your natural smile. With ceramic braces, orthodontic specialist Dr Mun is able to discreetly correct your tooth alignment when options such as Incognito™ Hidden Braces or Invisalign® aren’t appropriate. It may be that a more traditional type of treatment is necessary for particular concerns, such as when additional attachments and springs are needed. For patients who do not need to wear braces for long (such as only 6 to 12 months), ceramic brackets are an excellent economical choice when weighing the options of other aesthetic types of treatment. 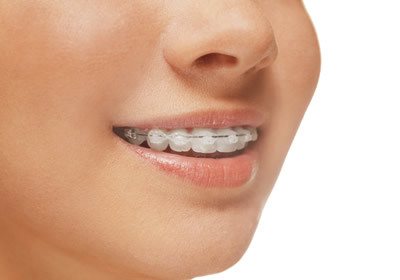 Dr Mun recommends ceramic braces when we need your results to look just right, but metal braces aren’t wanted. Although you can still see the tooth-coloured appliances on your teeth, they are far less noticeable than if you were to wear conventional brackets. If you’ve been putting a straighter smile off because you didn’t want to wear metal appliances, our ceramic option may be your best choice. Contact our Mona Vale orthodontic specialist to schedule a consultation at our practice.